Gold is a chemical element. Gold is in group 11, the copper group, it has 79 protons in its nucleus. It is a precious metal which has been used as currency. 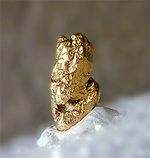 Gold is found in nature as nuggets or grains in rocks, underground and in deposits. It is a soft, shiny, yellow metal. The purity of gold in a compound is measured in Karats, with 24 karats being pure gold. 18 karat gold is three quarters gold, one quarter other elements, and so forth. Gold is usually in alloys because it is soft and pliable. Due to its characteristics being both resistant to oxidisation and rarity on Earth, gold is seen as very valuable. Gold is the basis for a monetary standard used by the International Monetary Fund (IMF) and the Bank for International Settlements (BIS). Gold is currently in excess of $1400 per ounce. Because gold is highly conductive and very resistant to oxidation, it is vital in electronics. Gold plating is used on switch contacts, printed circuit boards, and device leads. There is enough gold in electronic devices to make it worthwhile to process discarded devices in order to reclaim the gold in them. Gold was one of the three Gifts of the Magi, along with frankincense and myrrh. Gold is also used in jewelry. However, the New Testament instructs Christian women not to wear gold or pearls. Other uses of gold include aerospace, awards, bullion, coinage, computers, currency backing, dentistry, electronics, glassmaking, gold gilding and gold leaf and medical. This page was last modified on 27 June 2016, at 18:04.